Strong sales of cloud products to businesses helped lift Microsoft’s revenue by 18 percent last quarter, though its profits declined. Revenue for the quarter ended June 30 was US$23.4 billion, up from $19.9 billion last year and ahead of the consensus analyst estimate of $23 billion, according to a poll by Thomson Reuters. The revenue figure includes $2 billion from the Nokia Devices and Services business that Microsoft acquired. That deal closed 25 days after the start of the quarter. Net income was $4.6 billion, or $0.55 per share, down from $4.9 billion, or $0.59 per share, a year earlier. On a per-share basis, profit was down 7 percent year over year, including an $0.08 loss from the Nokia business. “We are driving growth with disciplined decisions, bold innovation and focused execution,” CEO Satya Nadella said in a statement. Nadella said commercial cloud revenue doubled year over year to a $4.4 billion annual run rate. Microsoft is switching its focus to selling more cloud services and away from on-premises software. The Devices & Consumer Division grew its revenue 42 percent to almost $3 billion, including the $2 billion from Nokia phone hardware. Meanwhile, the Commercial Division saw its revenue grow 11 percent to $1.28 billion. 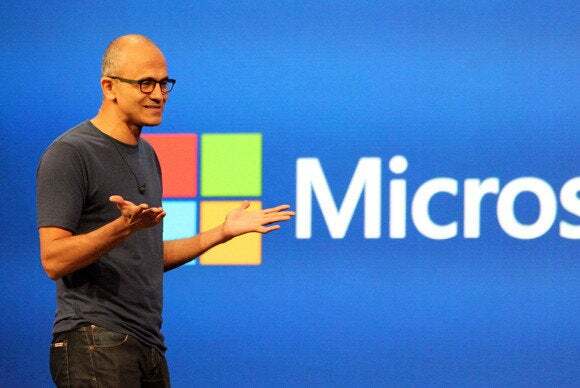 The results for the quarter—the fourth of Microsoft’s fiscal year—don’t include any impact from the 18,000 job cuts Microsoft announced last week and which will be carried out over the next 12 months. In the new fiscal year, which started July 1, Microsoft expects pre-tax costs from the layoffs in the range of $1.1 billion to $1.6 billion. The layoffs, amounting to about 14 percent of the company’s staff, are the largest in Microsoft’s history. The majority will come from Microsoft’s recently acquired Nokia business.